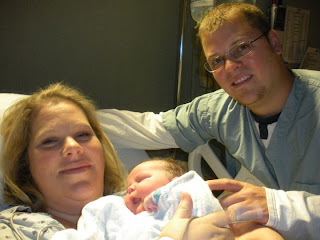 The Case Chronicles: Hayden Jean Case- Our new little one! 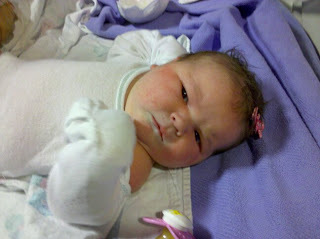 Hayden Jean Case- Our new little one! Well folks, I know it's been awhile but as you can see I have been busy! We just added a new spirit to our family and we are so proud to announce her and welcome her. 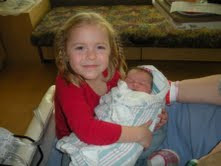 Hayden Jean was born 3-16-10, via c-section. 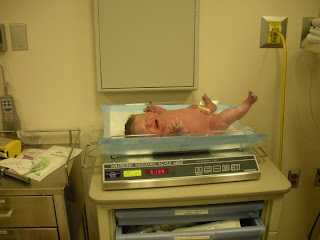 She weighed in at a whopping 11 lbs and 5 oz. Now, pick up your jaw....I know she was huge! We had a feeling she may be large as her big brother surprised us at his birth weighing 10 lbs 11oz, and that was 2 weeks early. Everything went smoothly with the delivery and I am currently in the hospital recovering, first c-section (what an experience). I can't wait to go home and be a big happy family! 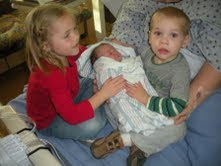 Hannah and Marshall are so excited about the new baby. 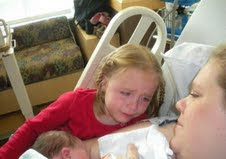 Upon viewing the pictures you will see in the last one that Hannah is crying. We had such a tender moment, her and I. She explained to me that they were happy tears and that she is so happy that Hayden has finally arrived and belongs to our family. Hannah has such a sweet sensitive soul and it melted my heart. I can't fully express my joy and gratitude as a Mom. I am so blessed and thank my Heavenly Father that he has trusted us to be great Parents to our little ones. My heart is so full! Life is Good! Hopefully with some time off from work I can dedicate some time to blog more. I have missed it and have so much to share...Josh is an amazing Man! To all my blog friends...It's good to see you and be back! Congrats on your new beautiful bundle of joy! She is a beautiful addition to your fabulous fam! Keep me posted on your recovery. 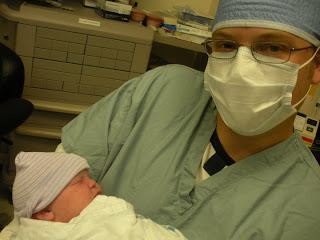 I had Abby c-section and intend to have number the same way. Let me know if you need anything!!!! Again, congratulations! Yay! She's the cutest biggest baby ever!! Ya know, your big babies are not making me feel all that great about reproducing these family genes ;) Haha, i guess what will happen will happen. As of right now Bryce and I are planning on being in Virginia around the 3rd of may through the 10th or so. I dont know if it would be too much to ask if we could crash at your place, but if we could we would love to hang out with you guys!! So, when you have had some time to settle in with Hayden we will give you guys a call and chat! Love you and Congrats again!